To add Wiimote support on Ubuntu 8.10, start by running the command “sudo apt-get install wminput wmgui lswm” to install the CWiid library and associated software. That’s really all there is to it. Once your Ubuntu machine can see the Wiimote, you can do all sorts of tricks with it. You could do head tracking, camera tracking, control MythTV with it, etc. Linux/Ubuntu 8.10 handles the IOGear GBU421 plus a Wiimote really well. Hey Matt. Thanks for putting this post together, I plan on linking my Wiimote up sometime this weekend. You mention a number of uses for the Wiimote at the end of your article…have you found any good walkthroughs (other than MythTV) for taking advantage of the new capabilities? I would love to simply program a few keyboard buttons (media specific, i.e. play/pause, rewind/advance, volume etc) to the Wiimote so I can control my media from across the room. Kyle Wegner, the direction that I’ve been moving in is the Wii Balance Board, so I’m not sure I can help that much with just the Wiimote. Again, YMMV. Hope it helps. That’s really incredible, I’m going to have to setup a partition for ubuntu just to try this. Wii Balance board? Like the ultimate human iPod shuffle! As a developer for Fife Council, Scotland I would like to use Google Analytics as part of an analytical mix but my IT department have told me that as part of security if a site needs to be bypassed the proxy it has to be checked first. No problem with that, but it was indicated that Google couldn’t be bypassed because the employer wouldn’t know if any employee rights were being abused by making iregular searches. So the question is: Can Google Analytics and Google Search be differentiated by url or IP etc, so that the Analytics could be used? Ha. My wife agrees it’s cute too! ha. So it seems to me you could put a wii controller in a model airplane running ubuntu an use the x, y, z pitch roll and accelerometer to basically have a less than $100 autopilot. Seem possible to anyone else? Matt, thanks a lot for this! It’s exactly what I’ve been looking for. However, does this include the IR functionality so it can point at the screen? I’m building a HTPC for my dad and I need it to be as close to the TV experience as possible. I’d be very interested to know if you end up with anything cool. Drop me a line: tom AT tdwright DOT co DOT uk. Very interesting – I’ve been working on a gaze tracking system, but having issues when the user moves their heads too much – I might go out and get a wiimote to see if I can tie that in. You mentioned the Wii Fit in your comments but not in the main article. Does that software work with the Wii Fit as welll? That is really cool and the installation package makes it easy for even avg users. As an aside, with no offense to the writer, it is ironical that a device like the wiimote would get the full GUI treatment while configuration of normal mouse buttons require users to go through manual detection via the terminal. Except for btnx, which was conveniently made unusable in Ubuntu 8.10, there is no easy way to detect mouse btns beyond left+right btns + wheels. Wii Balance Board, eh? Did you see what David Phillip Oster put together for Google Earth at MacWorld? Interesting post. Does this Wii hack break any TOS related to your WII hardward? How much stuff?! Theres not much at all to the WiiMote. The WiiMotes technology is all old nothing is that new. What is new and groundbreaking (And why its became a sucess is the use they’ve put the technology to. All it is is a bluetooth chip, an accelerometer, an eeprom, an integrated IR object tracker chip, some buttons and a speaker. All of the parts you can buy, the exception obviously is the camera tracker chip which hasn’t been make in mass production anywhere else so the most economical way is to take one out a WiiMote. WiiMote isn’t advanced in any technological way, its groundbreaking in the way mature technology has been put to use in a way that hasn’t been seen before. P.s I dont know what the point of this reply is to be honest, im just bored waiting for a design to synthesize. P.p.s. thanks for the guide! Howdy, does anyone know how to configure this program to write an output file of acceleration data? I am trying to perform an experiment in which two Wiimotes are attached to the arms of a double pendulum. I need to save the acceleration data to something like a text file. In the past I was able to do this with DarwiinRemote but the latest version no longer supports this feature. Hi everybody…I don’t know if anyone ever looks here anymore but I can’t get this guide to work. I’m new to anything Linux, help would be appreciated. Thanks! Oh ! 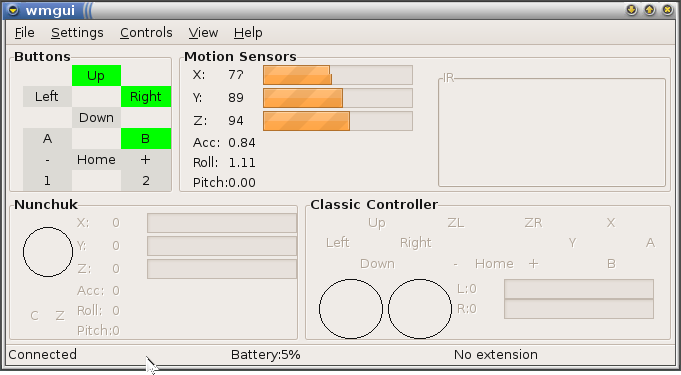 that’s really cool , I was just wondering for some Linux Based Gui for Wii-motes . Great Work!! Most of the connection tutorials I have read told me to press both the (1) and (2) buttons down while connecting to bluetooh. This did not work for me, my controllers have a red “sync” button located in the battery compartment of the wiimote. I spent and hour holding down the two buttons wondering why it would not work, so I hope this information helps saves someone some time. I created a few tutorials on the page below! I really like your guide which tells you how to connect to the wiimote via Cwiid in Linux. For an assignment at university, I would like to create a game (using pygame) or program in python which communicates with the Wii remote. Now, I know that you can import Cwiid into python, your balance board example shows that it can be done but I cannot seem to find documentation on the python module cwiid-python or cwiid. I want to know what the functions are to communicate with the wii remote and nunchuk so I can create a game based on the user pressing buttons and moving the wii remote and nunchuk . If I can implement the wii remote and nunchuk, then I will look towards integrating the balance board as well. Could you offer me any advice how to achieve my aims? I have tried multiple Google searches but to no avail. Hi there, thanks for posting this. I just have a few questions. 1) Where does your sensor bar go, and where do you plug it in? 2) What happens when you plug in the nunchuk? 3) Once you’ve programmed the Wiimote to your OS, does your mouse still work? 4) Will it work any longer on your Wii? I’m interested in playing FPS games like Half-Life with my Wii zapper, as well as other types of games. Thanks again. One of the best tutorials out there.. the visual help from the video was great, thank you! You made this really easy for me. And YES, I thought it was kind of cute too! !